Two wins, one shutout, 44 saves and a Player of the Week award. Not a bad few days for Tyler Beskorowany, huh? 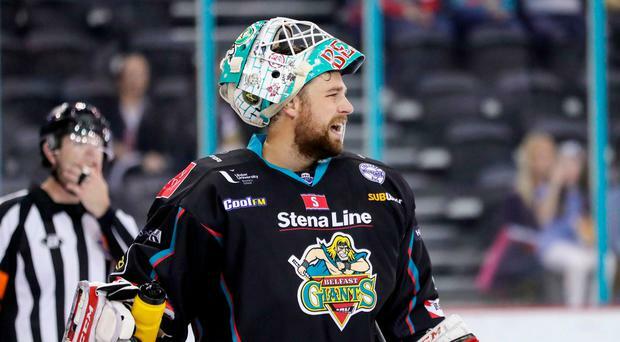 The Belfast Giants netminder has been loving life in Belfast since making the switch from Elite League rivals the Edinburgh Capitals, and the numbers the Canadian is putting up suggest he's very much enjoying his hockey too. Beskorowany has been without a shadow of a doubt the Elite League's outstanding goaltender, leading the league in goals against average (1.67) and save percentage (.940) through 19 games of the season so far. At the weekend he was at his dominant best as the Giants made light work of two of their biggest rivals on the road, accounting for the Nottingham Panthers 4-0 in Beskorowany's first 60-minute shutout in a Belfast jersey, before defeating the Cardiff Devils 8-1 at Ice Arena Wales. Turning away 44 of the 45 shots he faced, a .978 save percentage and a 0.50 GAA earned Beskorowany plenty of well-deserved accolades, but the Ontario native was quick to thank the skaters in front of him. "That was a good weekend for sure, for myself and the entire team," says Beskorowany. "They really made my life easy this weekend in Nottingham and Cardiff, we stuck to the program and the guys made a lot of big blocks." A former DEL Goalie of the Year in 2015, the pedigree was there for the 28-year old who was signed from the Capitals to be an upgrade on former netminder Jackson Whistle, and so far he's delivered. Despite putting up pedestrian numbers behind a putrid defense in the Scottish capital last year (4.06, .894), there was always the confidence that Beskorowany could rediscover that form from his time in Germany, which he puts down to the hard work he's done behind the scenes. "It's good preparation again," he insists. "Eating well, training well, getting the reps in on the ice and staying rested. Keeping healthy is the key part of it, I've been fortunate to only have the one injury up to now, and it wasn't even a massive injury, so it's been really good to get off to this hot start and hopefully I can keep it going for the rest of the year. "I've been proving to myself, and other people in the league who may have black balled me a bit for not working as hard as I should (last season), but to play three games in three nights is proving people wrong. That was my goal coming in, and the way I'm playing just shows how hard I've been working." The big backstop has been a vital cog in the Belfast Giants wheel that continues to gather momentum. That's seven wins on the bounce for the in-form Giants, who have now won 16 of their last 18 in all competitions and have taken nine of 10 on their extended road trip. Adam Keefe's side top the league by four points and finished as top seeds after the Challenge Cup group stage, looking irresistible in the process, with their forward lines clicking at one end of the ice and their netminder a very safe bet at the other, and Beskorowany admits that confidence couldn't be higher within the locker room right now. The netminder continued: "We've good preparation top to bottom. Guys are feeling confident, we really feel like we can beat anybody at this point at home or on the road. It's been a good stretch for us and hopefully we can keep it going. "In this game you can't get too high or too low. The boys have done a good job at keeping everyone level-headed throughout these seven games." Now they park their league campaign for a week as they turn their attentions to a European tilt in the semi-finals of the Continental Cup tomorrow, with the Giants welcoming Medvescak Zagreb, Rittner Buam and GKS Katowice to the SSE Arena for the three-day tournament. It's the first time the Giants have played in the SSE Arena for a month since they defeated the Nottingham Panthers on October 14, and getting back to home comforts after those 10 consecutive road games will be a welcome relief for the Elite League leaders, as Beskorowany admits. "It's nice to be back in this arena, we're looking forward to coming back and playing in front of a good home crowd and then getting back on the road, so we'll take advantage of it while we can," claims the goaltender, who is likely to start in tomorrow's opener against Zagreb. As for the games themselves, it could be a very close tournament. As hosts, and in the run of form they're on, the Giants will naturally be one of the favourites to progress to January's Super Final which will decide the overall winner, but their opponents all have claims to finish in the top two as well. Katowice, for instance, are on a 15 game winning streak in the Polish Hokej Liga and are already well on their way to taking the title, while Medvescak possess a star-studded roster with both NHL and KHL experience and Rittner are frequent competitors in the Continental Cup. "Realistically the preparation comes down to us. We have to prepare the right way and everything else will fall into place," believes Beskorowany. "The goal is to win all three games here and go into the Championship weekend in this tournament and come out winning it all, and then go on to the Champions League next season. That's the goal, and it'll feel good coming out of here if we get a couple of wins and then get back into the league mentality." Consistently there are always two players left out on the ice at the end of every training session: Lewis Hook and Jonathan Boxill. The duo will usually be doing work in front of the net or working on their tip-ins, trying to improve with every opportunity they can get, so much so that their after-practice work has almost become a ritual. "It just seems to happen!" laughs Hook, rejecting the notion it's become superstition by this point. "Look, I'm a young guy, I want to keep learning the trade and any chance we get after practice to work on the shooting, skating, stick handling is good. Boxy seems to do the same, so this is our time!" So far it looks like it's been paying off for the 22-year old, who has three goals and nine points so far on the season for the Giants and is putting together a very credible claim for a spot on the Great Britain roster for next summer's World Championships.